All Out War breaks out on October 9, 2013 with the release of THE WALKING DEAD #115, part of the celebration of 10 years of Robert Kirkman and Charlie Adlard's epic comic book series. Image Comics will be kicking off the celebration the night before, alongside retailers across the United States & Canada, with THE WALKING DEAD MIDNIGHT RELEASE PARTIES! For this special event, THE WALKING DEAD will be available for purchase in advance, at midnight on the night before release, October 9, 2013. THE WALKING DEAD #115 is the first issue of the monster event ALL OUT WAR, which will pit Rick Grimes and his group of Survivors in a fight for their lives against the other factions in THE WALKING DEAD universe: The Saviors, The Hilltop, and The Kingdom. 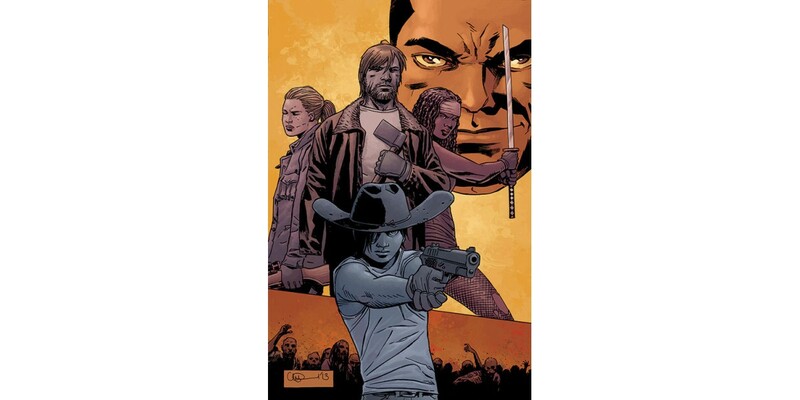 Comic book retailers will be able to sign up to host a midnight release party for THE WALKING DEAD #115 and in the process get exclusive giveaways and promotional items for the party, as well as the opportunity to order a special variant cover of THE WALKING DEAD #115, with brand new art from Charlie Adlard, available only to participating retailers. Fans who would like to attend a WALKING DEAD MIDNIGHT RELEASE PARTY should inquire with their local comic book retailers and ask them to participate. Comic book retailers in the US and Canada interested in hosting a midnight release party should opt-in with Diamond Code JUL138242 by September 6th, 2013. For more information, retailers should contact their Diamond customer service representative, or contact Image Comics directly. THE WALKING DEAD #115 is available for pre-order now, in advance of its release on October 9th, 2013, and features 10 individual connecting covers.